The following post was written by guest blogger James Colistra. Please read his bio after the post. 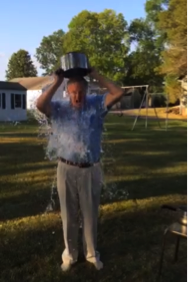 If you are on social media, by now you probably know all about the ice bucket challenge. Your Facebook and Instagram feeds are likely flooded with videos of people dumping ice water on themselves to raise awareness for Amyotrophic lateral sclerosis (ALS). At its core, the theory behind the ice bucket challenge seems flawed. Why douse yourself with ice instead of donating money? And why spend money on ice when you could give that money right to ALS? The truth is, people ARE donating. Most people who dump the ice water donate at least $10, and some donate $100. Furthermore, those of us in the marketing sphere know that video views can lead to dollar signs. Donating $10 while influencing 50 people to do the same is greater than donating $100—it’s simple math. In the charity business, it’s not unheard of to spend money to make money. For example, charity dinners that cost hundreds of thousands of dollars can influence the guests to donate millions more. Want proof that it’s working? According to The ALS Association, the cause has raised $1.35 million from July 29 to August 11 of this year. That doesn’t include donations to chapter offices around the country. During the same period last year, donations totaled just $22,000. I’m curious how many videos were uploaded on Facebook last week, it has to be a record! What I love about the challenge the most, besides the fact that it’s raising money to fight a horrible disease, is that people who have never uploaded a “selfie” video before have come out of their comfort zone to do so. I’m looking forward to the look on my wife’s face when she tackles this challenge tonight – she has a few more hours to accept a friend’s nomination. The desire to see your friends’ reactions to the freezing cold ice is exactly why this challenge works. It’s human nature to want to see other people embarrass themselves just a little bit, but dumping ice on your head is not too far over the line that people won’t do it. While Slate has reported that the initial idea came from various celebrities and was not related to ALS, I give a lot of credit to Pete Frates for his courage and ingenuity in the face of this debilitating disease.